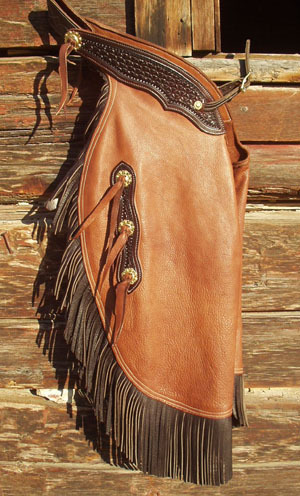 Chaps not only provide protection from the weather and brush, they give the rider a superior grip on the saddle. 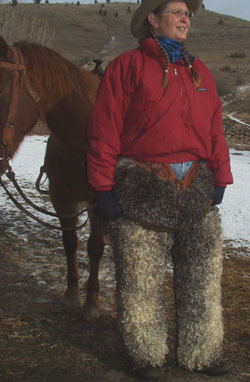 Shotgun, 5-snap, and zippered chaps provide the most coverage and warmth. The 5-snap chaps and Colorado Work chaps are sufficiently ventilated to be comfortable in summer, too. Cool in the summer, and easiest to walk in, our Chinks are made Northwest Style, providing full coverage to the inside of the knee and are long enough to kneel on. This type of chink uses almost the same amount of leather as full length chaps. Chinks with less coverage are available upon request. 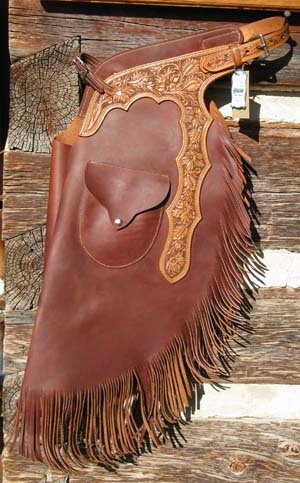 All my chaps are made of oil-tanned, work weight leather unless requested otherwise. 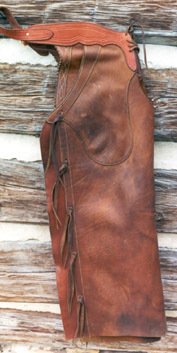 Zippered chaps are made slightly lighter in weight to facilitate a good bend in the knee area. 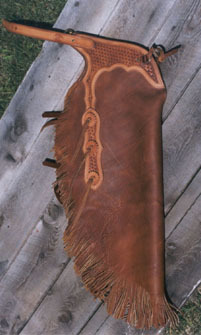 American Bison, Water Buffalo, and Horsehide are also available. More colors of leather are available besides what are pictured on these pages.To see more colors, go the leather colors page. Measure your inseam fully and leg measurements snugly when using the chap chart at the Order page. Exotic hair-on chap materials include Angora (white, black, and some bright colors sometimes available), Tibetan Lamb (finer and longer than Angora, black or white), Bear, Buffalo, and brindle, spotted or black Cowhide. 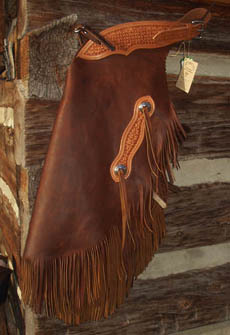 American Bison Glove-tanned leather on the legs, surrounded by dark brown American Bison fringe to match the star-stamped tops and side yokes. Nice feminine cut to this pair, accentuated by rolled and scalloped leg tops, wrap-around back belt, and brass berry conchos. Top yoke extends down to protect hip while dragging calves or pulling a pack string (feature available on any chap or chink for $35). Your choice of rear belts: rodeo lace-up, or buckled belt; front string tie (for safety) or front belt, full fringe pictured. Glovey chinks with floral carved roping yokes and conchos made from commemorative coins form the 1968 Olympics in Mexico City, each coin appearing to weigh one ounce Sterling. Coins were domed and a loop back was brazed on to connect to the belts in back. Got the chaps last night. The leather is beautiful, and they fit like a glove. I couldn't be happier. When my friends are drooling over them, I will be sure to give them your name. Thanks a lot, Ed Kisling"
Leather is available in many more colors besides what is shown on these pages. Brass, Stainless, and Sterling Silver Conchos available in various price ranges depending on style and size, ranging from $2 each for simple brass conchos, $6 each for fancier brass conchos, and $8 to $20 each for engraved brass conchos, to $15 and up, each, for engraved sterling silver conchos ; please call for quotes. Spots available in Brass, Nickel, and Sterling; call for quotes. Generally about 20 to 30 cents apiece for brass or nickel spots, depending on size. Nickel-silver spots are now available, too.